Every so often a tarot deck comes out that focuses on offering original insights into how to read and interpret the cards rather than just new artwork themes. 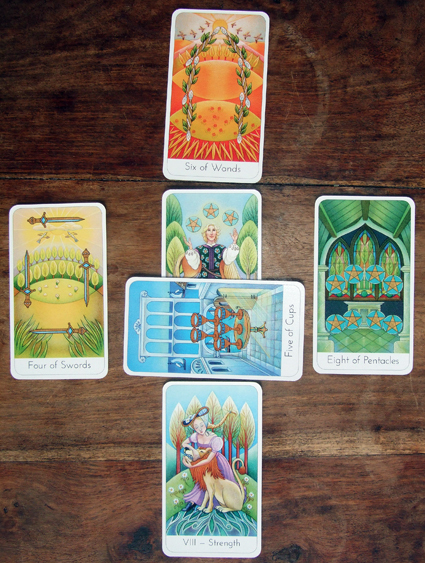 The Wisdom­ Seeker's Tarot is one such deck. Don't get me wrong, the artwork is good, but the main focus of the deck is on personal development rather than fortune telling or divination. The Wisdom­ Seeker's Tarot is by David Fontana who was a Fellow of the British Psychological Society with a long and illustrious background in psychology as well as a tarot expert. This is what he brought to bear on this deck. The press release I was sent, by publisher Watkins, described the deck as "cards and techniques for self-­discovery and positive change". It continued: "This beautiful kit is ideal for everyone interested in improving their self-­knowledge and boosting their self­-empowerment. Tarot cards have captivated seekers of the truth since the 15th century. Whether used for self-­development or meditation, these fascinating cards can hone your intuition and enhance your understanding of the many influences affecting your life." The book that comes with the set covers the history of tarot and the historic and esoteric background to the symbolism of the major arcana, court cards and minor arcana. What I found particularly fascinating was that the minor arcana are described primarily in terms of the meanings of the suits and also the symbolism of numbers, rather than giving a Rider-Waite-Smith type interpretation for each card. You are not meant to learn by rote what each card means and use that when reading them. Instead, you are prompted to use them as tools for meditation and personal insight. David Fontana explains that although you can do readings in which you take the cards as having some synchronicity with life events, you can also regard them as being drawn completely by chance, but nevertheless use the images to stimulate your thoughts. 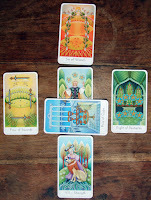 The deck is perfectly suitable for both experienced tarot users and newcomers. In fact I think it strikes a great balance between potentially offering new insights for intermediate-level readers and explaining the cards simply enough for beginners to learn with. 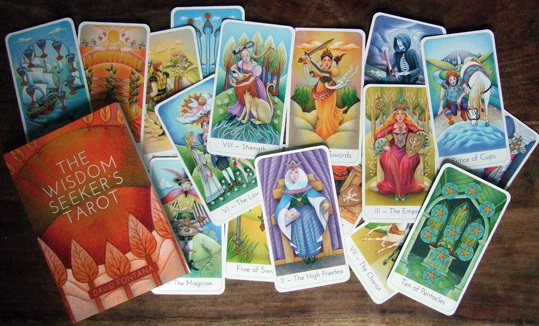 At the moment it is one of my favourite tarot decks to work with and I am using it a lot. I should mention that The Wisdom-Seeker's Tarot is an updated version of David Fontana's Truth-Seeker's Tarot, which is now out of print and collectable, so if you are lucky enough to have the earlier version you probably don't need to buy this one. However, if you don't have the old set, this is your chance to get a new copy at a very reasonable price. The RRP is just £14.99. Note: David Fontana lived from 1934-2010 and wrote numerous books on psychology, meditation, symbolism and tarot.